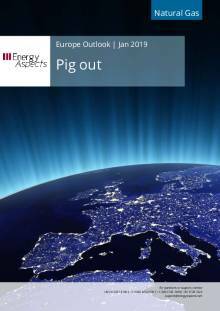 2019 will be the Chinese year of the pig, but the Gregorian 2019 has started out with Europe dining out on LNG, as the long-expected but much-delayed tip of the global gas market into something close to oversupply appears to finally be happening. As a result, the EU gas market is showing signs of being far more comfortable, aided by winter weather that has so far had little in the way of real bite. The comfort factor is being reflected in prices. TTF Feb-19 and Mar-19 are now trundling around 22 €/MWh, low compared to prices at the start of the winter, when Q1-19 was priced at 27.5 €/MWh. Outside of the end of January, when a cold spell has been forecast, a return to normal weather patterns would see considerable y/y reductions in end-user demand amid greater supply, buoyed by LNG. 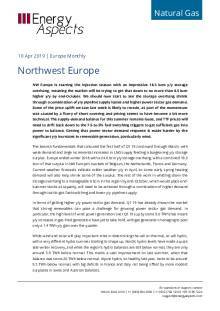 We forecast that there will be much higher LNG supply available for the European market, up by almost 5 bcm y/y across Q1 19 and by 22 bcm y/y over 2019. While there is plenty of winter risk left that can alter the EU market’s demand dynamics, a seasonally average end to the winter would mean a healthy 35 bcm end-March storage carryout, compared to 16 bcm last year. A sustained cold-weather event over February and March that is as chilly as the same months in 2018 would swell demand by around 10 bcm on our expected (normal winter) levels. We are forecasting an end-January storage carryout of 53 bcm, which would be 5 bcm higher y/y. Adding in almost 5 bcm of expected additional LNG supply, the February-March call on storage would be around 25 bcm, but that would still leave end-March storage 10 bcm higher y/y at 26 Mt. Pipeline supply over Q4 18 was soft, with reductions seen from some usual suspects (the UK, the Netherlands and Algeria) as well as some less usual sources (Norway and Russia). While the mitigating circumstance was weaker demand, the question is will pipeline supply still be so accommodating over 2019? The answer is mixed, with reductions expected from the EU producers, but potentially more Norwegian gas as Aasta Hansteen ramps up. The wild cards are potential reductions in nominations of contract gas from Russia and Algeria - and with end user demand over the summer likely to have a much lower need for storage injections - the answer is likely to be the both importers will see a drop in nominations. Our balances do factor in a drop in pipeline gas of over 11 bcm y/y across 2019. The weaker balances do suggest that flat price levels do need to weaken to get more gas into EU power generation. Almost all of this will need to come from coal-to-gas fuel switching, as only Nordic hydro could support an increase in the call on thermal, with Alpine hydro, nuclear and more renewables all likely to be limiting the call on thermal as we go through 2019. In turn, this does point to a step down in fuel switch triggers (or relative prices). If coal (80 $/t) and carbon (23 €/t) remain at current prices, then we would expect summer average gas prices to trade around an 18.8 €/MWh mean. At that level, gas plant with a 5% efficiency advantage over coal plant will be in the money. Some support to flat prices could come from the related fuel markets though. We are bullish oil and forecast Brent to move up towards 70 $/bbl for the summer, which will support a 90 $/t Cif ARA coal price. We are also bullish carbon prices, which we expect will average 27 €/t over the summer. Given those two relative prices, the TTF average moves to around 21.8 €/MWh. For the Sum-19-Win-19 spread, there will likely be lower demand for storage injections given a y/y storage surplus, and more LNG supply. Therefore, a much softer summer compared to the winter (which will still carry weather risk) is likely, suggesting once we get closer to the end of March, that spread could widen out.